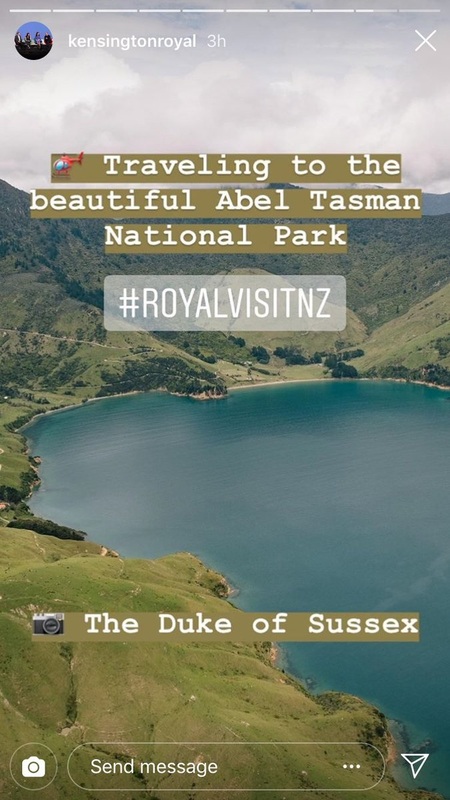 Following a morning in Wellington, the Duke and Duchess of Sussex travelled to Abel Tasman National Park, an area famed for its golden beaches and native bush walks. 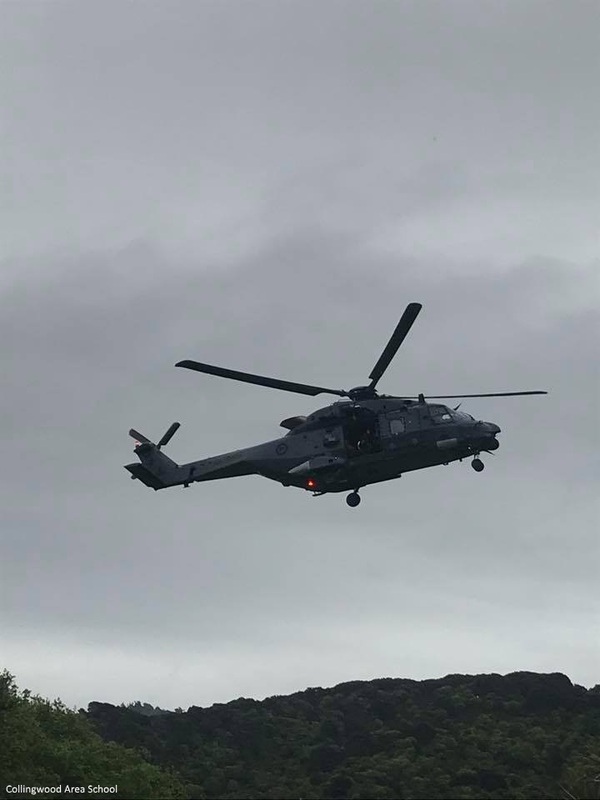 Harry and Meghan arriving in a helicopter. The Palace shared this photo taken by Harry. A hongi greeting for the Duke and Duchess during a traditional welcome ceremony. A video from the rainy arrival. 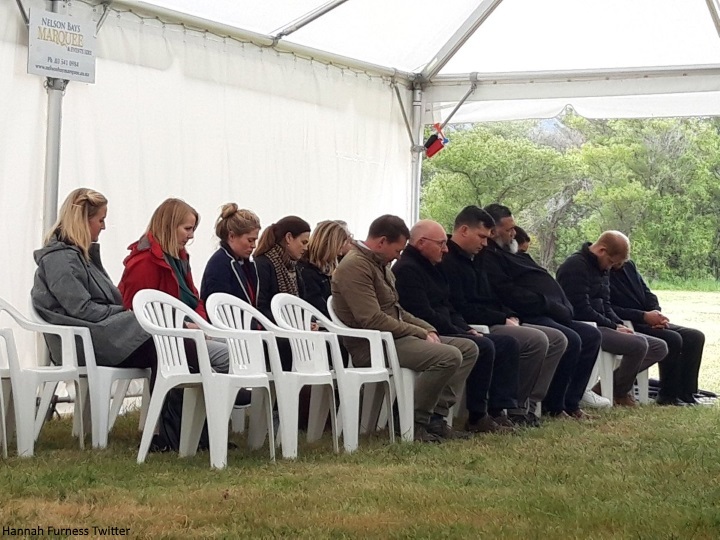 Hannah Furness reports: "A welcoming ceremony. You can only see the top of Meghan's head because, while she's in the front row as honoured guest, her chair is a few inches back from the men for cultural reasons. 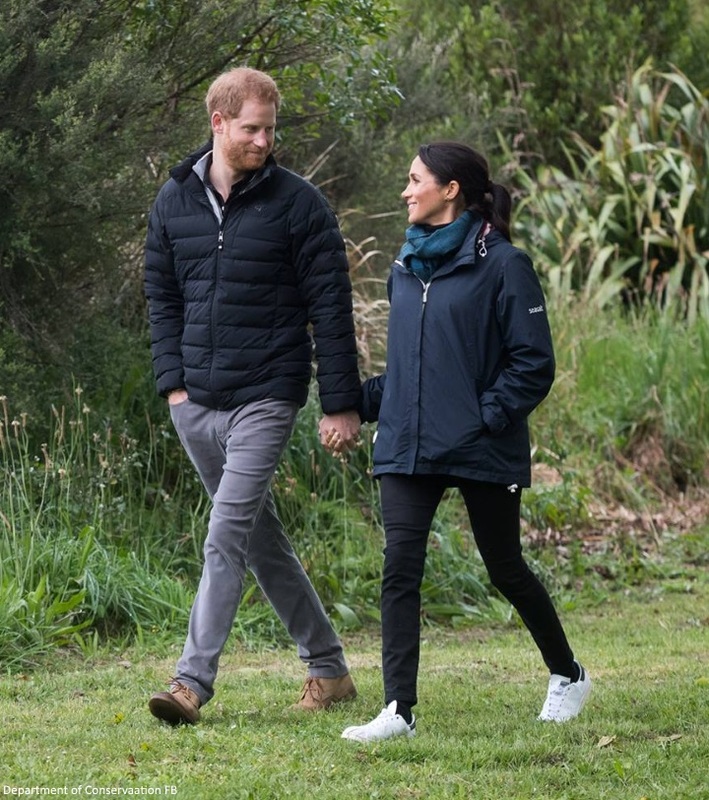 It is a gesture of protection in Māori culture "
"Inside a marquee set up on the grass, local kaumātua Barney Thomas spoke in te reo, wishing them "kia kaha" with their "pepi", Meghan smiling as this was translated. He later explained that he'd told the royals, "There's two of you now and there will be three of you soon, and I'm sure you'll be supported." Meghan sat in the front row of a line of plastic chairs, but hers was set a few inches back from Harry's. Barney, of Onetahua Marae in Golden Bay, explained, "The middle represents the god of war and we don't want to put our women into that space. We want to be inclusive but especially Meghan, because she's expecting, we don't want to put her at any risk." Abel Tasman National Park is a wilderness reserve at the north end of New Zealand’s South Island. 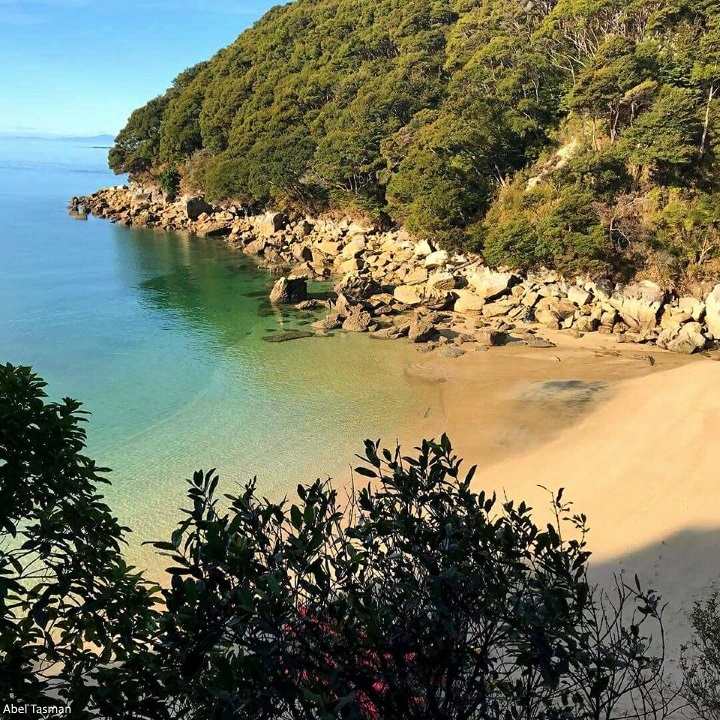 It’s known for the Abel Tasman Coast Track, a long trail winding over beaches and across ridges between Marahau in the south and Wainui in the north. The headland at Separation Point is home to New Zealand fur seal colonies. Little blue penguins, bottlenose dolphins and seals inhabit the Marine Reserve. 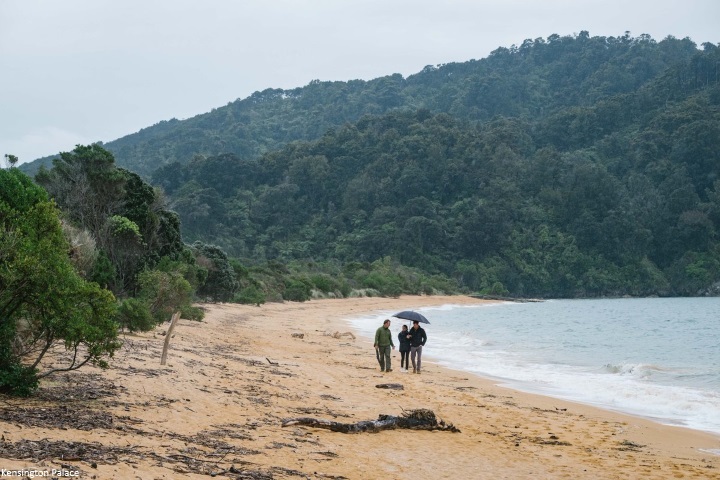 The couple embarked on a trail walk with one of the park’s rangers Andrew Lamason, to learn more about the history of the forest and the environmental challenges of protecting the park’s habitat. They discussed ongoing conservation programmes. 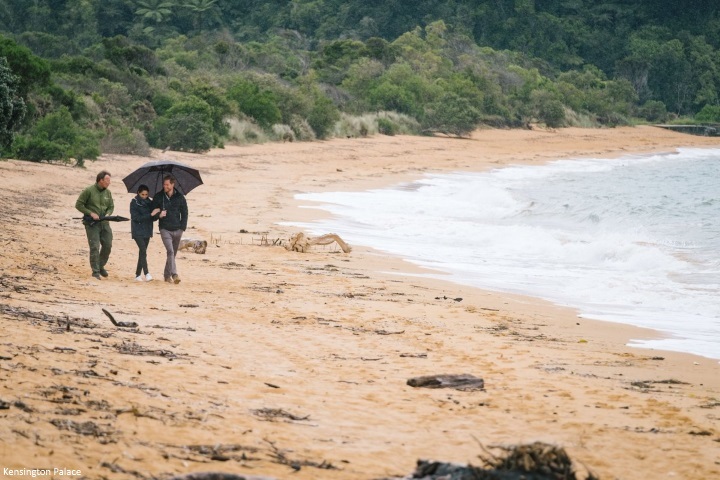 The Duke and Duchess visited Totaranui, a 1km-long golden sands beach in the park, which is managed by the Department of Conservation, who work with community and school groups to educate them on conservation. The Duchess with students from Collingwood Area School. 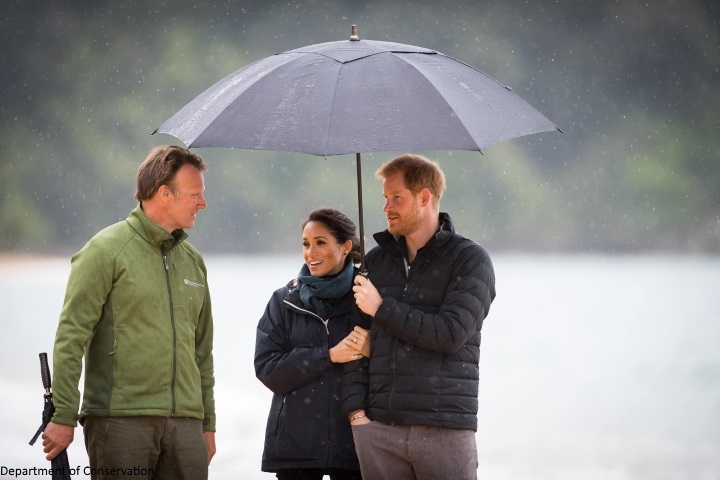 Harry and Meghan met staff and rangers. Before departing, the Duke and Duchess joined some of the park’s young ambassadors and local school children at a barbeque lunch. 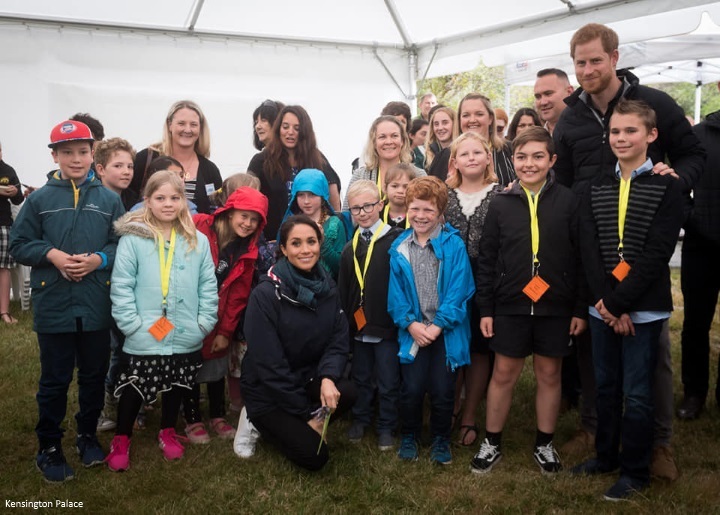 'A planned tree planting was called off due to weather, with the royals instead joining school children and youth volunteers for brownies and tea in the marquee. As Harry and Meghan served themselves, a local kuia commented, "There should be someone serving them!" 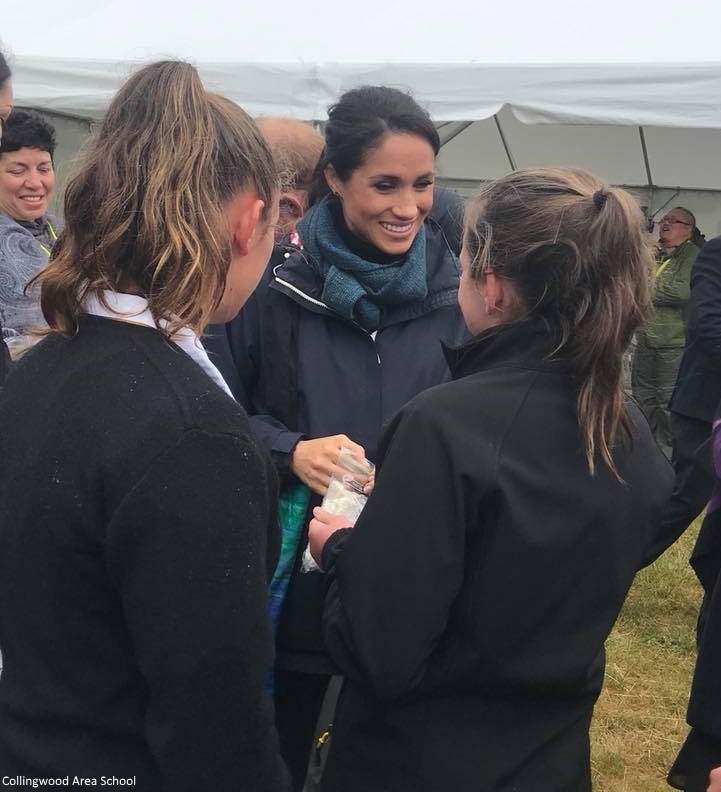 After meeting Harry and Meghan, Milan Chapman, 15, of Motueka High School, said, "They were very nice, chatty and relaxed." Pippa Struck, 13, of Golden Bay High School, added, "They were just so calm. You see them on TV, but when you meet them, you realise they're just normal people." 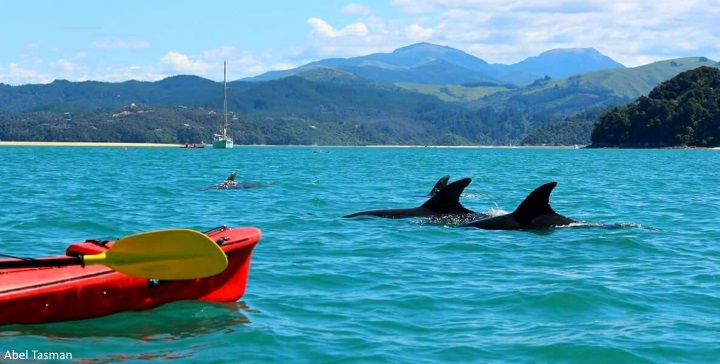 Saskia Gray, 16, an Abel Tasman Youth Ambassador, commented, "It was a great opportunity. I'm very fortunate to have this chance. They acted very down-to-earth, and they genuinely care about the people and the land." 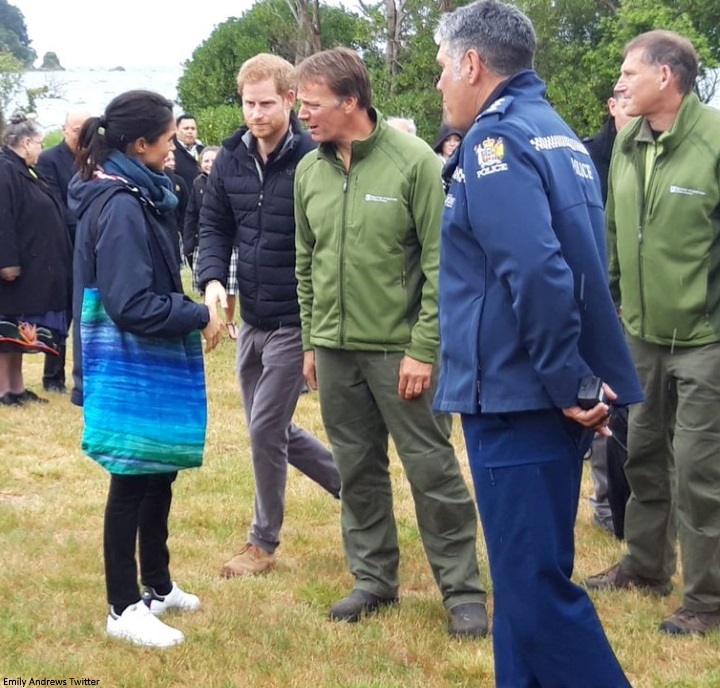 After a group photo, the royals were presented with gifts, including a painting of three tui by Takaka artist Robin Slow, which represents them and their unborn child. They both admired it, with Meghan saying, "Thank you so much." 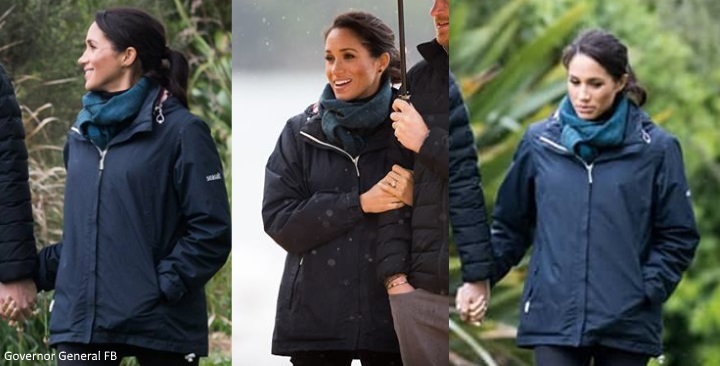 The Duchess wore a jacket by Seasalt - a Cornish fashion company. Women’s clothing, footwear and accessories inspired by the creative and maritime heritage of Cornwall. The jacket Meghan's wearing doesn't appear to be available online, it's possibly from an upcoming collection. Meghan wore her Outland Denim Harriet jeans from this morning. Meghan's trainers are the Stella McCartney / Adidas Stan Smith grosgrain-trimmed faux leather sneakers. 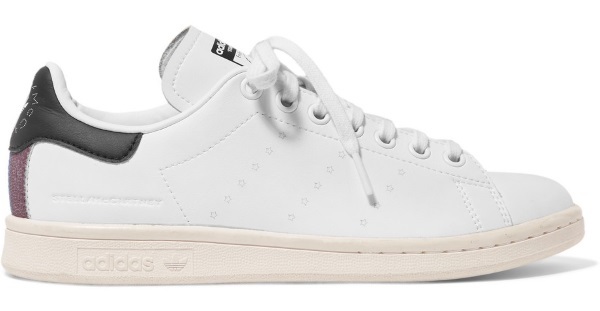 "When I met Stan Smith years ago, I thought he was so chic and such a gentleman and that his sneaker was so iconic... a collaboration between him, me and adidas Originals just made so much sense," says Stella McCartney. The first vegan alternative to a cult-favorite silhouette, this pair is stamped with an original portrait of Mr. Smith on one tongue, and Stella on the other. They're finished with signature perforated stars and a grosgrain heel tab." 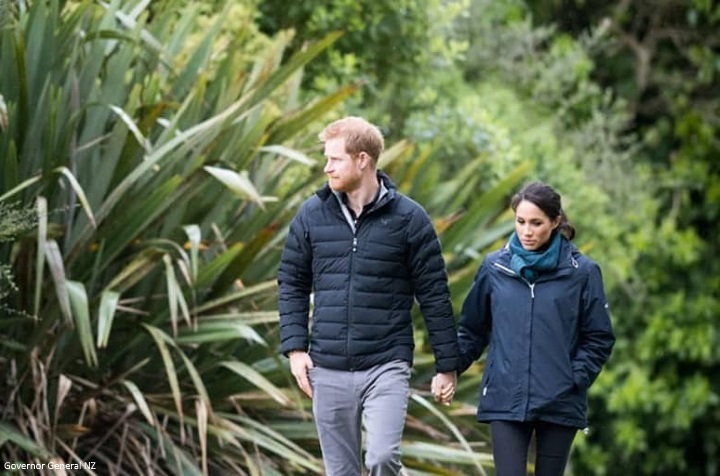 This evening, back in Wellington, The couple will visit Courtenay Creative for an event celebrating the city’s thriving creative arts scene. I love the part about “someone should be serving them!”. Too funny! Gosh, I hope everyone got more to eat than brownies and tea. Yes, last night the on site press reported they had to cancel the barbeque as well as the tree planting. Wind and rain. I hope so too. A lovely outing. Good for the two of them for going, being engaged. The clothes are not important...except her wearing does help some of these less well known brands, I am all for promoting smaller companies:). 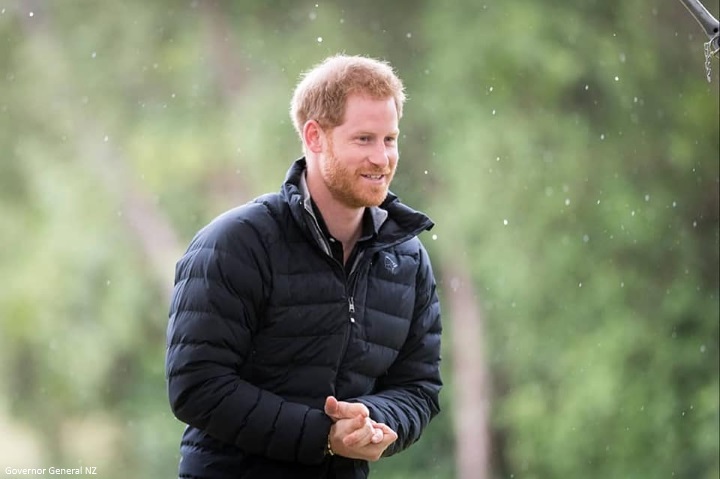 I can see the fatigue on Harry's face in the arrival video and his obvious concern for Meghan being out in the elements. I think they have both held up well throughout the tour, but I hope they are able to get some much needed rest back in the UK. I wish them the very best for the rest of the you. And Charlotte, I wish you the very best as well. Your coverage of this tour has been unprecedented. You deserve an award and I know that most on this blog cannot thank you enough! You're rock star! I couldn't agree more with your 2nd paragraph, SDR! Looks cold and wet, but they both look snuggled up in their jackets. What a fabulous two weeks. Harry's comment, "our little bump" was so charming. Meghan arrived in Sydney wearing that white sheath and I wonder if she can still fit into it. It must be so exciting everyday for both of them. I saw a little bit of the reception this evening. Meghan's dress is darling. Can't wait for Charlotte's post. I figured Meghan would be all bundled up for this outdoor event. Love the comfortable look. One more day to go! It's wild how much time we've spent with the two of them. Still looking forward to seeing what Meghan wears tomorrow! I LOVE Meghan's scarf and bag!!! My favourite two items from this tour. The weather here is the same as there in the pictures so I sympathise and wish they don't catch a cold! Picture 13: She wore a different jacket here. Do we have any id? She’s tiny. And Harry looks tired and a bit crabby. And New Zealand looks amazing. Wonderful to read the comments that the Duke and Duchess are “normal” and “down to earth” when you get to meet them in person. Both descriptions are endearing because wealth can make some people snobbish, arrogant and abusive with power. Both are dressed appropriately and the Duchess and the “little bump” look warm. What a beautiful country and thank you, Charlotte for capturing some of it for us in your posts. Interesting cultural insights and traditions on display (the Duchess’ chair, etc). Wise decision NOT to plant the tree in the inclement weather. Thanks, Charlotte.